This black and white scene had an assembly of cardinals at rest in a snow covered bush. 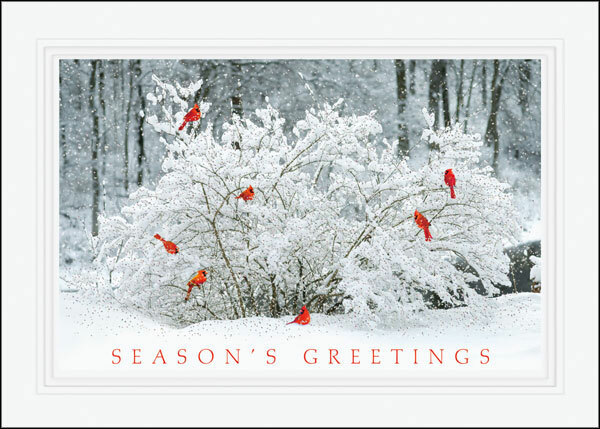 Season's Greetings is printed below in red ink. You may have up to four lines of text imprinted on the inside of the card. Your personal lines of text will be centered under the selected verse and printed in the same color that was chosen in the section above. Your copy will be printed exactly as typed so please show UPPER and lowercase as desired. As an added service, we can imprint your return address on the back of the envelopes. Fill in the copy to be printed showing upper and lowercase as desired because your copy will be printed exactly as typed. The address will be printed in the same color ink or foil as shown on the inside of the card. Return address imprint pricing is based upon the number of boxes being ordered. Please see the pricing table shown above.